Guadeloupe is a group of islands present in the Leeward Islands of the West Indies. While situated in the Caribbean Sea, Guadeloupe is in fact an overseas region that belongs to France. Funnily enough, that means that it is considered a member of the European Union and uses the Euro for currency despite its Caribbean location! Lots of sunshine, soaring temperatures and a breath-taking natural landscape makes Guadeloupe a popular tourist destination, particularly with the French and other European countries. Sport fisherman can certainly be included in this category as there is an abundance of fantastic fishing locations to be found here – most notably deep sea fishing. Deep sea fishing ranks among the best type of fishing any tourist will find in Guadeloupe. This comes as little surprise considering its Caribbean Sea location, with so many prime offshore fishing spots . This means you will need to hire a charter to suit your preferred style of fishing, although most offer the best types of sport fishing, including big-game, chumming and jigging. The best charters will also provide most of the equipment too, allowing individuals to focus on their fishing rather than hiking around their equipment! There will be many species available to catch throughout the year, most notably blue marlin, barracuda, and wahoo – swordfish can be caught during night excursions too. Seasonal species includes spearfish that tend to be found from March to October, and mahi-mahi can also found between November and June. 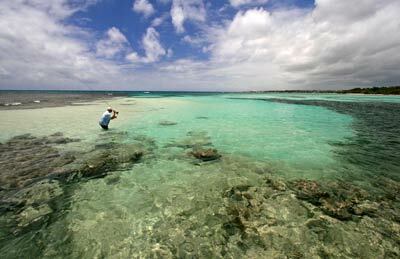 Fly fishing is the next big type of fishing present in Guadeloupe. This can be credited to the massive saltwater flats that surround the coasts of the islands, providing many great spots to cast a line for any fly fishing enthusiasts. So a good set of waders will be needed in any case, especially if wading out for a great spot. Additionally, many boats will also be available for hire that are suitable for the shallower waters here. Marin Cove and Little Marin Cove remain some of the most popular locations for a bit of fly fishing, although there is countless more waiting to be explored. Grande-Terre (the easternmost island) is known to have some of the best flats out of all the islands and is amongst reefs that can be waded in without the need for a boat. Whether it is flats found here or the more popular Marin Cove areas, there is a great selection of species waiting to be caught here. Trout, snook, tarpon and bonefish are a few of the most prominent species that will likely be found in these waters.